Hyderabad April 17 (IANS) In a setback to the Telangana government the Hyderabad High Court on Tuesday revoked the disqualification of two legislators of opposition Congress from the state Assembly. Justice B. Siva Sankara Rao set aside the expulsion of Komatireddy Venkat Reddy and S.A. Sampath Kumar and directed that their membership be restored. The court observed that if they have done anything wrong the government may take disciplinary action but removing them from the House was not proper. The two legislators were disqualified from the Telangana Assembly last month after they tried to disrupt the Governor s address on the first day of the Budget Session on March 12. Amid the ruckus the Congress members allegedly threw headphones injuring Council Chairman K. Swami Goud in his eye. The legislators denied the allegations. The next day the Assembly passed a resolution expelling the two Congress members. The Congress legislators had challenged their disqualification and also a gazette notification issued by the Legislature Secretary notifying vacancy for Nalgonda and Alampur (SC) Assembly constituencies which they were representing. Earlier in its interim order the court had directed the Election Commission not to issue poll schedule for by-elections in their constituencies for six months. The Congress leaders in their petition argued that that they were not given any notice or opportunity to explain the alleged obstruction or interruption or undignified behaviour at the time of Governor s address but they were singled out as Chief Minister K. Chandrasekhar Rao had a personal vendetta against them. 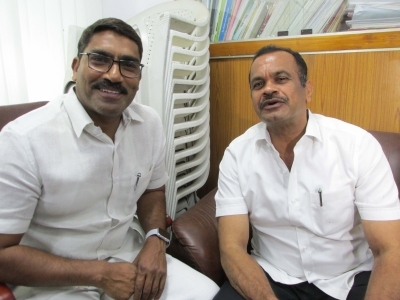 Reacting to the court verdict Venkat Reddy said justice has prevailed and the Chief Minister "fell in his own trap". The former minister said despite all its conspiracies the TRS could not harm him. State Congress chief Uttam Kumar Reddy said the court judgment was a "slap on the face of the TRS government" adding at least now the government should mend its ways and function in a democratic fashion.